We do not do lookups on this project. 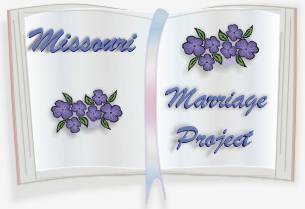 The marriage records found on this site is what we have available at this time. As transcriptions become available they can be found here. What you will find on Microfilm in the Marriage Records section. The Marriage record, Application, and Register of marriage licenses are on three different rolls of microfilm. Marriage record: Record of marriages performed, giving name and residence of contracting parties, date of marriage, signature of party officiating, date of filing, and certificate of recorder. Arranged chronologically by date filed. Parental consent in noted for parties under age, but the name of the parent consenting is rarely given. Later records include marriage license and certificate of marriage. Application for marriage licenses: Applications for license to marry, showing date, names, residences, and ages of contracting parties, consent of parent or guardian of minor, and signatures of applicants. Register of marriage licenses: Record of certificates of marriages performed and marriage licenses issued and returns on same, giving names, ages, witnesses person officiating, residences of both parties, name and address of parent or guardian, and date and place of ceremony. Arranged chronologically. Page last updated Wednesday, July 30, 2008.